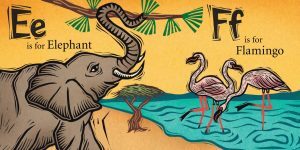 A guest post by illustrator Sue Todd. Her linocuts can be seen in An African Alphabet, out now! What is the technique and process of linocutting? Once my rough sketch is approved, I transfer it to the linoleum with carbon paper, clamp it to my desk and start carving, keeping in mind that, as with all relief printing techniques, the areas I do not carve will be the printed line or shapes. When the carving is complete, water soluble printing ink is rolled onto the linoleum. I place it on the press, cover it with a sheet of printmaking paper and run it through the press. Once the print is dry I scan and colour it in Photoshop. For large images that don’t fit my small press, I hand print using a burnisher and lots of muscle. 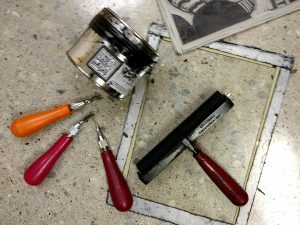 How did you discover linocutting? My linocutting technique was born out of a desire for a new creative challenge. In a former life, I made a living as a retail layout artist. My husband, who is also an artist, handed me a piece of lino one day and gave me a quick lesson. I started messing around with carving and fell in love with the printmaking process. What is your favourite characteristic of the medium? I like the quality of line that comes from making marks in the lino, and I still get a kick out of peeling the paper off the inked plate to see the final print. The thing I love about this technique is the variety that comes from combining analog and digital technologies. Walk us through a day in your studio. My days are flexible and not too structured. I don’t have children and that gives me the opportunity to work all the time! If I have a deadline looming I will focus day, night and weekends until it is done. If I have no commissions, I will spend time marketing and working on my own projects. I have a few graphic novels on the go, and I paint and sketch digitally and in oils for pleasure. At some point every day I will take one to two hours away from the studio for exercise. Some of my best ideas come while cycling, and I swear I would have been laid up with some kind of repetitive strain injury by now, had I not built in a regular yoga practice. Tell us something surprising about being an artist. Work and play are one and the same for an artist. If I have no commitments or social activities planned, I “work” all the time. It may be different, and healthier, for artists who have studios away from home. What does your artistic process involve? 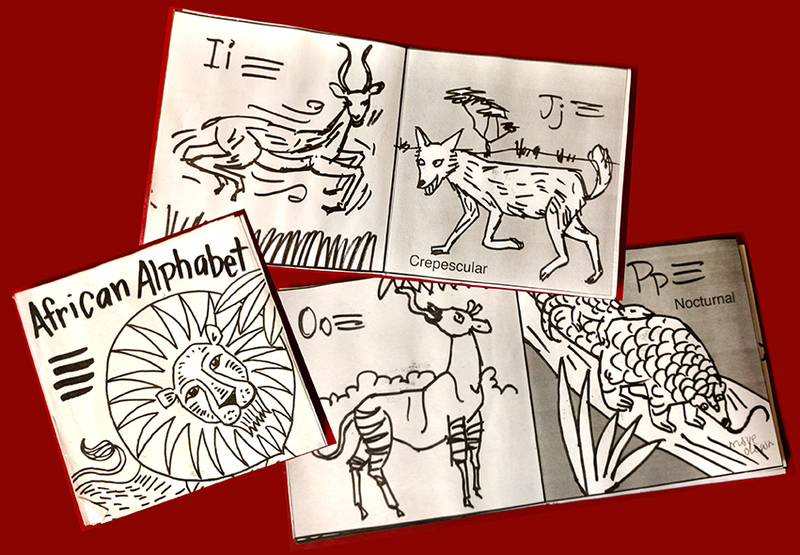 Let’s examine my process for creating An African Alphabet. Before beginning sketches I spent a few weeks gathering references from books and the internet and scribbling the animals in my sketchbook to get a feel for them. Although my style is not realistic, I still need to know what the actual subject looks like in order to depart from reality. Next, I started sketching quick little thumbnails to get a sense of how the image might fit with the text. I created a small dummy to make sure each page flowed nicely and made a cohesive package. Once the thumbnails were approved I traced them over to make a more comprehensive sketch that would be my guideline for the carving. The carving stage of An African Alphabet coincided with the summer months and I was able to do much of it at the cottage, another perk to freelance. If anything, what was challenging about the illustrations for this book? 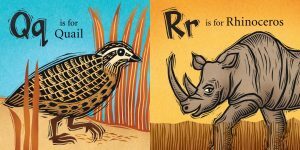 Animals are my favourite subjects which is why An African Alphabet was so fun for me! The only challenge was to make them friendly for young children without crossing the line into anthropomorphism. Tell us an unusual anecdote about your art! 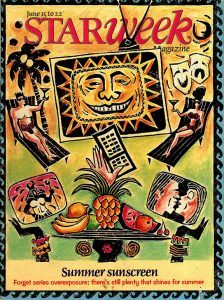 The Toronto Star produces Starweek, a TV guide magazine. Back in the day, they regularly had illustrated covers and it was my goal, as a novice illustrator, to one day see my art on their cover. One of my first interviews in 1991 was with then art director, Neil Cochrane, who offered me a Starweek cover on the spot! I was so excited about achieving my grand goal that I forgot to ask about payment. The Star became a regular client and I will always remember Neil for taking a chance on a newbie. I saved that cover and it’s interesting to see how my style has evolved over time. Sue Todd is an award-winning illustrator living in Toronto, Ontario. She is a graduate of the Ontario College of Art, now OCADU. Sue began her career as a freelance designer in retail advertising. 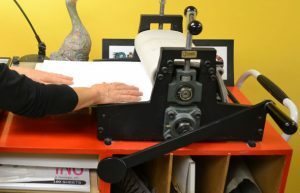 For a more creative outlet, she took up linoleum carving, an ancient printmaking technique similar to woodcut, and developed a unique style of art that led to a career in illustration. Sue has created images for a wide range of clients, from advertising and corporate to editorial and publishing. For more information, visit www.suetodd.com.